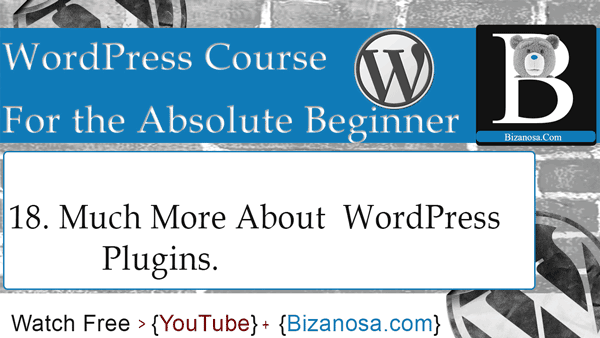 Hi and welcome back to this WordPress course. In the last video we learnt something about plugins. In this video we are going to install WordPress plugins by extracting the plugin files right into the plugins directory within the WordPress directory. Let’s get started. I already have this plugin, Contact Form 7, the plugin that we did install in the last video. I already have it downloaded. So, what I want to do , is extract it. I want to extract this file into the WordPress directory. Let’s go into Xampp and go into the WordPress directory . So, I’ll go back into Xampp and then htdocs, WordPress for beginners folder, wp-content , then plugins. I want to extract this folder, into the plugins folder. So, on Windows, I will just drag it into that folder. And just with that, the plugin is installed. Actually, you can change the name of the folder if you wish, the plugin will still work. So, let’s go back to our dashboard. So here you can see we only have Akismet. However, if I reload the page , you will see that contact form 7 has been installed. And that is not the only way. I’m still going to show you another way by going to this link or that link. As you know, this link and that link lead to the same location. So what I will do, I will delete this plugin. And then confirm the deletion. I will then go here. And, you see there is an option to upload a plugin. So I will click on this. On this page, I can bring in my plugin zip file and I would be able to install it once I do that . Let us go to our plugin folder. I can just drag it in there. And then click install now. You drag in the zip file not the extracted file. So, the plugin has been installed successfully. If you are working on your local computer , you will experience lots of this. Don’t let that bother you, this is because you are working on your local computer. I will activate the plugin. So we’ve seen how you can install this plugin in three different ways. So in this part I want to show you how you can just uninstall it or delete it by removing it from the plugins folder. So if I go to the plugins folder . You can see the contact form is here. So I can delete it . If I delete this. And go back to the plugins page, then reload , you will see the plugin is gone. You can see that issue there, if you refresh again, that will go as well . So, in the next video, we are going to start working with themes. See you in the next video where we will take a look at WordPress Themes .